PowerDRY.ME – a unique technology product to reduce blow dry time by up to 50%. Fab.ME – the mother of all hair treatments, with four defence formula that will give you your youthful, fabulous hair back in a matter of seconds! Puff.ME – The FIRST EVER super-volumising powder spray in a pump to pep up medium to thick hair to give you the instant volume you’ve always dreamed of. Puff.ME Light – A lighter version of Puff.ME, this super-volumising powder spray is perfect for fine to medium hair. 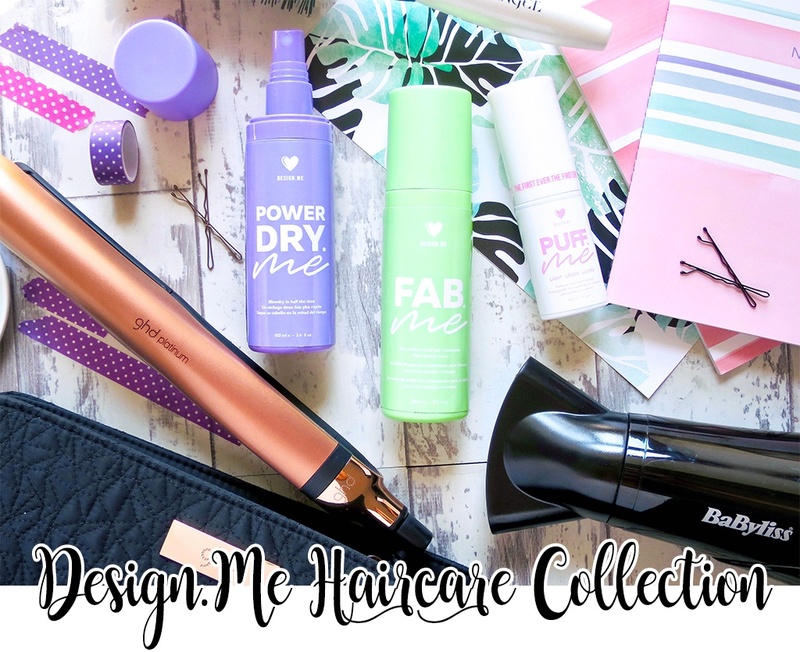 DESIGN.ME products give hair sheen, oomph, volume, and styling speed. Plus, these high-quality products are vegan, cruelty-free and contain not one single drop of harmful sulfates, parabens or gluten. I have such a quick hair care routine and the fewer products I need to use each day the better. I like to keep it simple and this Fab.Me Hair Mist is described as ‘The mother of all hair treatments’ and it really is! It has so many wonderful benefits from hydrating to detangling and even protecting against heat damage caused by styling. How adorable is this little pink and white bottle?! Well, let’s just start by saying it looks cute but the packaging was a nightmare for me – this is a powder and for some reason when I took the lid off so much of it puffed out all over the place. I wouldn’t travel with this and I would say not to put the lid back on. This product is to give your roots volume and texture and it does that in abundance. I have to say I wasn’t 100% blown away with this and it left my hair feeling weird and the powder wasn’t translucent in my hair. When I used it I 100% had to wash my hair the next day otherwise my hair felt like straw. I think I prefer to use a standard dry shampoo to achieve the same results, this product is great in theory but needs a little more tweaking. Say hello to my new best friend – as most of you know in the UK we have had some of the hottest weather we’ve seen in a LONG time and the last thing anyone wants to be doing in this heat is spending ages blow drying our hair (and melting in the process). So this Powerdry.Me mist has halved the time It takes me to dry my hair. This mist is wonderful if like me you have thick, unruly hair, it speeds up drying times by up to 50% and it also leaves your hair sleek, protects from damaging heat and UV. So it’s the ideal product to add to your hair care routine this Summer. I am singing its praises and have been recommending it to anyone that will listen. Decreases your blowdrying time by 50%!